We’re off to one of my old haunts this week – Nottingham! Rhea of Handmade Nottingham is a regular supporter of Just A Card and you’ll see her frequently sharing the message over on Instagram (you may have seen her Card of the Week posts!). 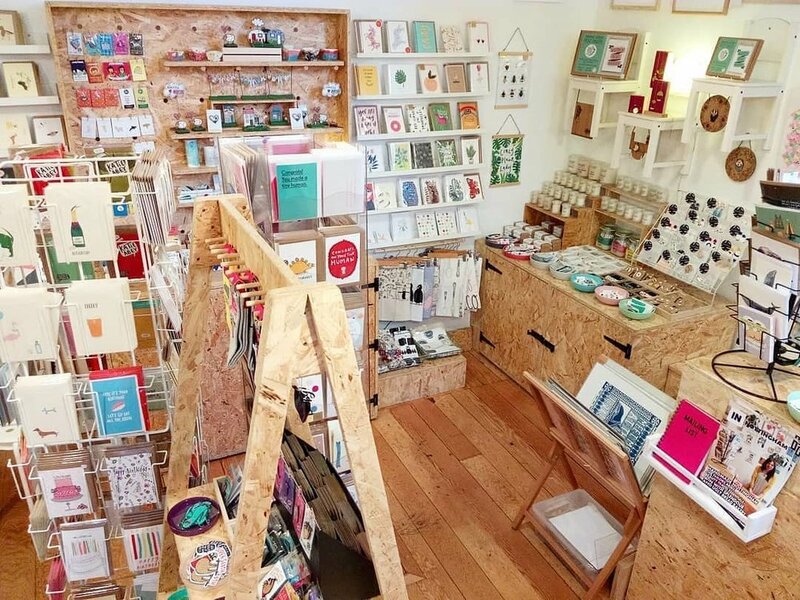 Here she tells us how a pop up became permanent, shares her big plans for the run up to Christmas, and explains why its so important to support one another’s small businesses. 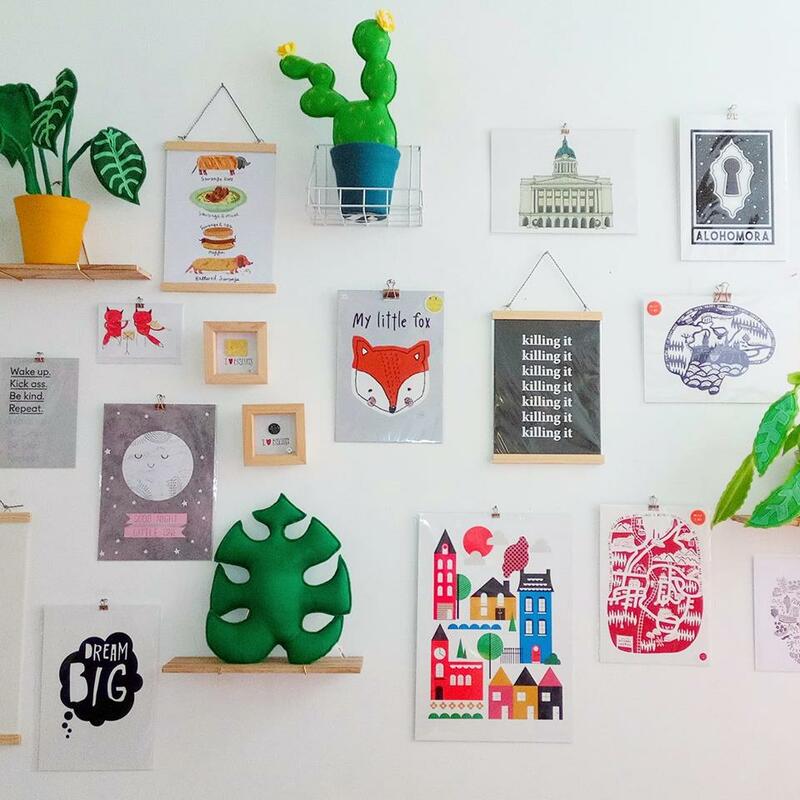 Handmade Nottingham shop began in November 2014 as a pop up shop for Christmas. After an amazing response we stayed and have been here ever since! I am passionate about all things independent and my aim is to create a platform for designer makers to sell their beautiful products on the high street. I curate the best local designer makers to create a treasure trove of design led products and I'm proud to support indies while offering our customers truly unique products. Like most creative jobs my days can vary a lot from serving customers as you would expect, to hunting around the shops for hula hoops for a that window display idea I’ve been thinking about. The shop is open Tuesday – Sunday leaving me Monday to work at home catching up on admin I didn’t get done in the shop. When I’m in the shop I do a lot of multi tasking while serving customers including getting out deliveries, running all the social media platforms, replying to emails/messages, managing stock, planning and hosting events and visual merchandising including one of my favourite things – window displays. I work with amazing illustrators to create the window displays. I create all the back drops and decorations and they draw beautiful art work on my windows matching the theme. They are always left to do their own interpretation of the theme and I always love what they come up with! Where do you work? What is your shop like? What do you enjoy doing when you're not working? I spend most my time working from my laptop at the counter in the shop. When I’m not working in the shop I work from home in the company of my little kitty Bella. I am a self confessed workaholic so there is rarely a day I’m not at least thinking about work but my favourite hobby is anything textile design related. I trained as a textile designer and specialised in knitwear at uni. Any spare time I find I use to play with yarn and create. I hope to one day return to being a maker, and find that perfect balance of shop owner and designer. But for now my focus is on growing Handmade Nottingham and supporting all the amazing designers out there. The shop is small but perfectly formed. There are over 40 designers stocked in the small space so I have spent years getting creative with displays to make the best use of the space. Including working with independent business The Workbench who created all the custom OSB furniture in the shop. I try to get a balance of easy to browse while being like Aladdin’s cave where you discover that perfect gift that your friend will love, or something to keep for yourself. I think competing with chains and online is a challenge, but I also think since opening 4 years ago there has been a shift in where people decide to shop. There has been a surge in people shopping independent, which I think the Just A Card campaign has contributed to! We are seeing chains closing their stores but in their place independents are popping up (at least in Nottingham) and I think this is a combination of customers getting bored of the same old products and wanting something new, but also caring where the products they buy come from, which is great! I also think even though online is a great place to shop for convenience, people are still coming to independents because they can offer an experience. I stock so many designers and products and sometimes such low quantities or limited runs of products that I am not able to list them online. But my customers know this and check back in regularly to see what’s new in store. I have been dreaming for the past couple of years of having a bigger shop and I am excited to say it has now come true! I am very excited to announce that we will be opening a pop up shop for Christmas in a bigger, better and more central location in Nottingham! The shop will stock 80+ designers from across the UK along with additional space to host workshops and events. The pop up shop will be open from early October until 24th December 2018. Our current shop will continue to stay open alongside the pop up, but with reduced days so we can manage the two shops over Christmas. I can’t wait to open up and see how the pop up period goes! Like our first shop we are testing the waters with this pop up period and if it goes well we will stay and make it HN’s new home! Support each other. I really believe that indie businesses thrive when they work with and support each other. Running a business is hard work so we all need all the support we can get. Yes, for us enamel pins and coasters are popular small purchases. A little treat for yourself or a little gift for your mate because it made you giggle. Having a bricks and mortar shop with monthly overheads means the Just A Card Campaign is very important to me. It helps customers to understand the costs involved in keeping a shop open, and if they want to come back each Christmas to buy all their gifts then they need to support indie shops the rest of the year, even if it’s just a card. I have been following the campaign for years so at a guess I probably first saw it on FB. But I follow it on FB, Twitter and Instagram. Instagram is definitely my favourite platform to browse as a user, and as a platform for the business. I am a very visual person so I am naturally drawn to it. Displaying Just A Card stickers in windows really does help spread the word about the campaign and that spending a little can help a lot. To help promote the campaign every week I pick a Card Of The Week. This gets displayed in the shop window all week, with the Just A Card sticker below. It has been a great way to catch peoples eyes, make them read about the campaign, and come in to see what’s in store. I also think a great way to support the campaign is to simply share the campaign online. A simple comment or share doesn’t cost a thing and can help spread the word.